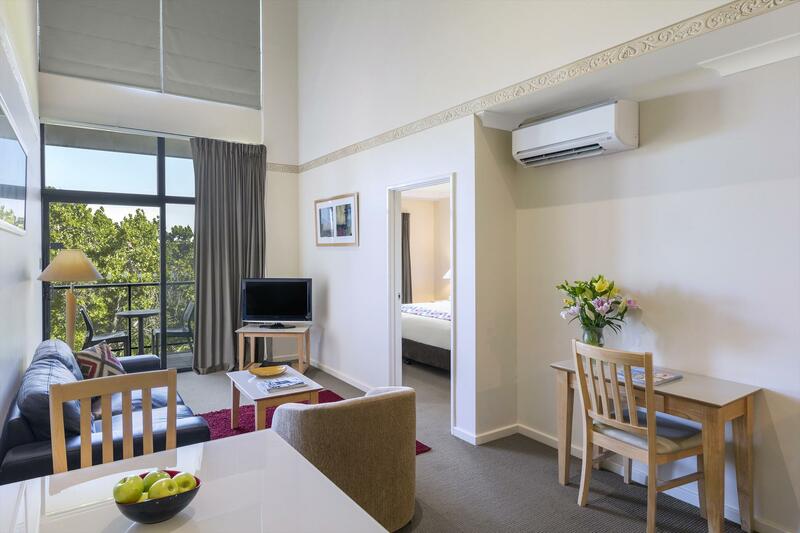 Perth's leading full serviced apartment hotel in the city's best location. Village style complex, consisting of 8 buildings interspersed by leisure facilities, gardens, tennis courts and swimming pools. Complimentary parking also available. 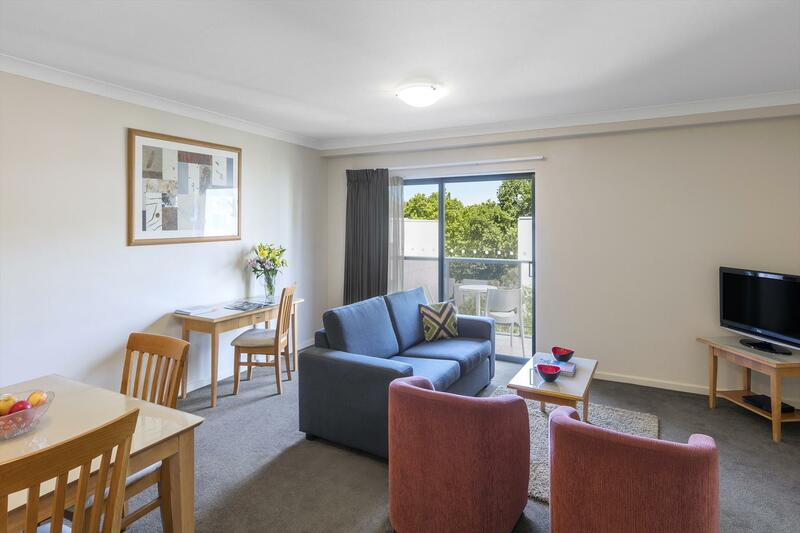 Mounts Bay Waters Apartment Hotel has 150 immaculately appointed one, two and three bedroom apartments. Mounts Bay is the ultimate place to be for business or leisure. Whether your looking for short, medium or long term accommodation. 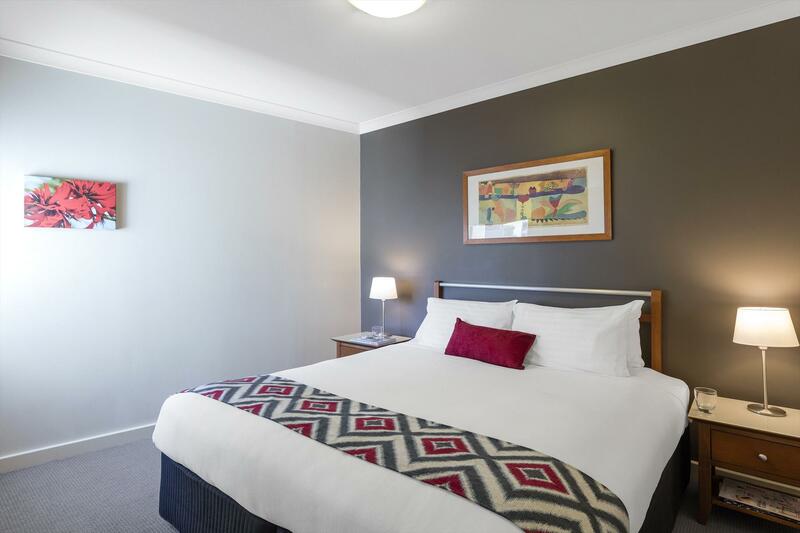 The property sits at the base of Kings Park, within walking distance to the banks of the Swan River and is but a few minutes walk from the centre of the central business district; also easily accessible using the free Transperth bus service. The hotel also offers an onsite restaurant, extensive leisure facilities (2 gyms, 2 pools and 2 tennis courts) and meeting facilities. Self-contained one-bedroom apartment with a private balcony or courtyard, a separate combined living and dining area and a fully-equipped kitchen. Other features include dishwasher, a washer & dryer and FREE undercover secure parking for 1 car. Self-contained two-bedroom apartments with one bathroom, a separate living and dining area and a fully-equipped kitchen. Other features include a private balcony or courtyard, dishwasher, a washer & dryer and FREE parking for 1 car. Stay longer and save! Self-contained one-bedroom apartment with a separate combined living and dining area and a fully-equipped kitchen. FREE undercover secure parking for 1 car. Non-refundable prepayment required. Stay longer and save! Self-contained two-bedroom apartments with one bathroom, a separate living and dining area and a fully-equipped kitchen. FREE parking for 1 car. Non-refundable prepayment required. Stay longer and save! Self-contained two-bedroom apartments with two bathrooms, a separate living and dining area and a fully-equipped kitchen. FREE parking for 1 car. Non-refundable prepayment required. Self-contained one bedroom apartment with a private balcony or courtyard, a living/ dining area and a kitchen as well as FREE parking for 1 car. Full non-refundable prepayment required. Self-contained two bedroom apartments with one bathroom, a living/ dining area and a fully-equipped kitchen as well as FREE parking for 1 car. Full non-refundable prepayment required. Self-contained two bedroom apartments with two bathrooms, a living/ dining area and a fully-equipped kitchen as well as FREE parking for 1 car. Full non-refundable prepayment required. Take advantage of our Super Saver rates! FREE parking for 1 car included. Full, non-refundable prepayment is required at time of booking. Take advantage of our Super Saver rates! Package includes daily continental breakfast at the Courtside Restaurant. Please note on public holidays, a breakfast box will be provided instead. FREE parking for 1 car included. Full, non-refundable prepayment is required at time of booking. Take advantage of our Super Saver rates! FREE parking for 1 car and 2GB daily WiFi included. Full, non-refundable prepayment is required at time of booking. Enjoy special Super Saver Rates! FREE parking for 1 car and 2GB daily WiFi included. Full, non-refundable prepayment is required at time of booking. Unless the rate you have booked has special terms and conditions any bookings cancelled within 24 hours of arrival will be charged one nights accommodation fee. Please check the rate description for any special cancellation or prepayment terms. A bond of $200 to $500 depending on your booked room type will be requested by the hotel at the time of check in as security. For all credit card payments there will be a transaction charge of 1.4% in addition to the total amount.